I don't have an opinion one way or the other, but I was just wondering if anyone knows the reasoning behind this? In my directions from Roll-line says center plate, then add 3 mm toward outside of sole. So this image below seems to be translated from Italian ("using a hammer" LOL) and says for a "measurement of 38". I guess that means 38 degrees? 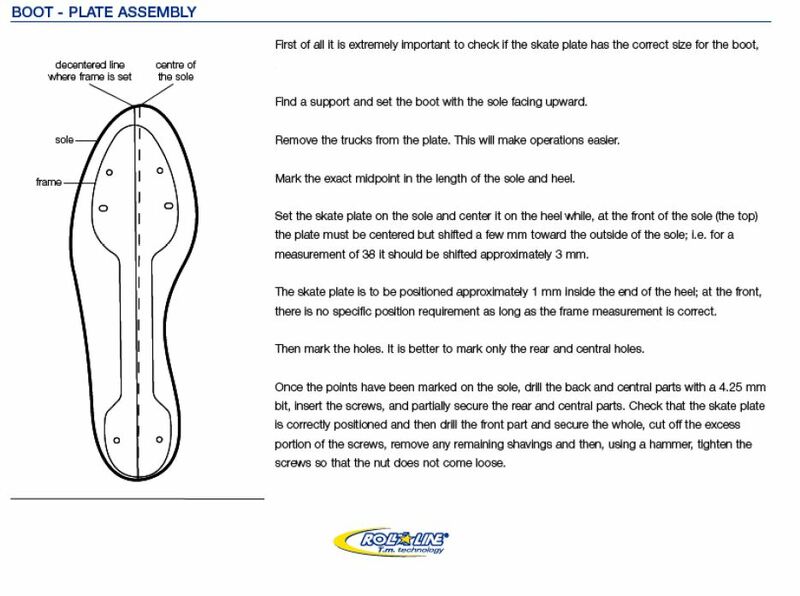 So does anyone know what the " 3 mm toward outside of sole" does?. I know some people ignore this all together and just put the wheels right under the boot (midline). I also understand the setup above is more popular in artistic skating, right? I am kind of asking because I have supination (rolling outward motion of the foot) and was wondering if I am better off leaving the 3mm extra out? I figure I don't need help in that direction, but maybe there is more to this than I understand. 38 is european size of the shoe. It's a US 6 I guess. You can actually use a hammer once the screws are shortened to avoid nuts to unscrew. Now about centering, that's a lifetime debate. Depend on what you want to do with your skates, how you foot and ankle works, how you skate, etc. On roll line plates, the axle project on the side apex of the front part, so at this point, the plate should be in the middle of the sole (don't know if this is clear enough though). But read post #20, it lays out where to place the plate and why. Do read the thread, some post’s actively encourage improper plate placement. I have skated with outside mounting and centered mounting. I now skate centered boots. When skating offset, at speed, the turns put extra stress on your ankles. I stressed a tendon in my ankle years ago. I had been having an issue with pain in my right ankle after 4 hour sessions. It got worse and finally stressed. I was off my skates a couple of weeks and decided to re-align my boots on the plates. It took a while to get used to because of muscle memory to adjust to a centered boot, but but I have never had an issue with stresses on my ankles since the re-alignment. I skated offset boots for a very long time, even back when I skated as a teen. My boots will always be centered now. Also, if you skate an outdoor setup with very large wheels and high deck, the issue is magnified. I always wondered about that " hammer" comment, now I know. I like locking nuts myself. Thanks for your thoughts. I have foot pain and my wheels were noticeably way more toward the inside. I purchased them originally from a rink skate shop. Never trust a rink skate shop is the lesson I have learned. Do it yourself, it's not that hard. The people at the shop though the midline was were the center stitching is located, so naturally my alignment is off. I'm mad at myself for not checking it. Thank you so much for the good advice! I will be skating with a centered plate from this day forward! Muscle memory will be messed up for a while, but balance should be better and maybe the pain in my instep area will go away. "A typical skatelog thread, confused and rambling..."
Yes, I have noticed that. I have played lots of sports over the years but for some reason roller skating seems to have more than its fair share of confusion. I don't know, I think it might be because while skating is definitely a sport, it also has strong elements of an art as well. That's part of why I enjoy it so much. But sometimes the knowledge handed down feels almost like folklore. There are cases for using offset centelines on boots. I know a guy that is still very fast and used both boots offset to one side and used it in his inline race setup for tracks. A detuned(slowed down response) quad could be used this way as well. 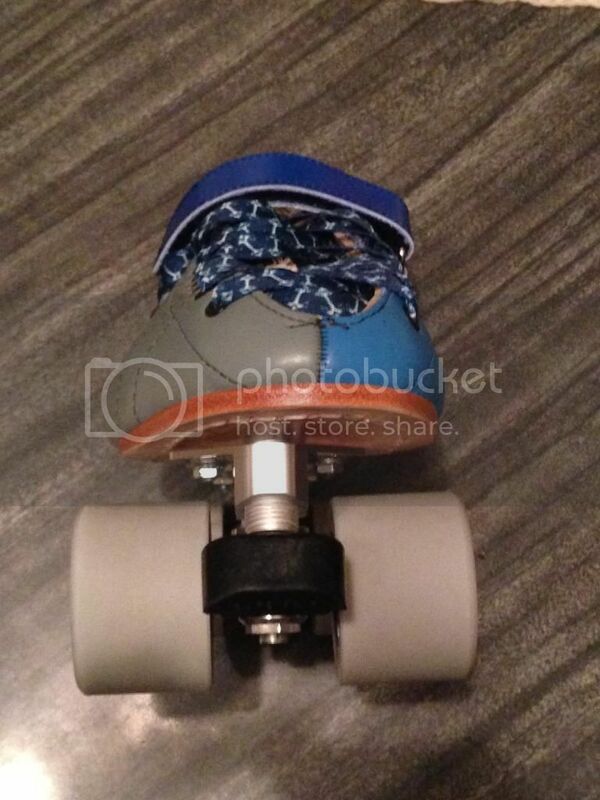 Detuned it will skate more like an inline but wont turn with pressure toward the rear wheels like an inline. I suspect it is not B&W too. Especially if roll-line has that as their official mount. I am not as experienced as many on here, however I have noticed that many skate configurations (maybe all) are trade-offs. You get something, but you lose something else in the process. Guess it depends on what you value the most and what you want to do. Right now I'm feeling safer about mounting it on the midline. Yes, different types different mounts. After centering, all I lost was pain... I dont know much about "factory recommended mounting" parameters. All I have to go on when getting the correct mount is where do I really like the front axle and the rear axle when getting up on the back wheels (balance point). That puts my axle center length in my comfort zone. Center it and tune it, Im good to go. Thats just my opinion, not for everyone but good enough for me. Opinion is a huge gray area.. Since I have foot pain and it sounds much like yours, I'm going to give the centering a try. I'll let you know how it goes in the next few weeks. It's a hard call, my coach says center, Sin City skates here in San Diego says center, but most of their customers are derby and park I think. simply because Roll-Line is likely to be more correct if that document indeed represents the company’s view. Also I don’t skate Derby and no off-set seems to be (don’t know) more popular with Derby. However, the case is far from closed. The is a VERY controversial topic so much so that plate manufacturers don’t even want to go there. I could not find a single public document from ANY of the plate or boot manufactures calming that there is only one correct way. In fact, none of them seem to want to touch the topic! Not even Roll-Line, I got that document through a Roll-Line rep. I understand and respect your reasoning on the subject, I do not think you are wrong. But I doubt it is as black and white as you are making it. Obviously there are a whole lot of skaters who don’t off-set or bought them that way. You may say they are all disadvantaged, but there is no real proof one way or the other, they are just theories. There is no way to measure the difference, or at least no one has. If there is a big difference and they are really disadvantaged as you say, clearly it has never been enough of an issue that people see it is wrong and stop doing it. “99% of the human population finds that off-setting the plates slightly gives proper balance while roller skating". Obviously this statement is not true or there would be no controversy. It would also be true that 99% of the human population have never skated on both to compare. And even if they did try both, it would be extremely difficult to exclude subjective factors not to mention muscle memory. 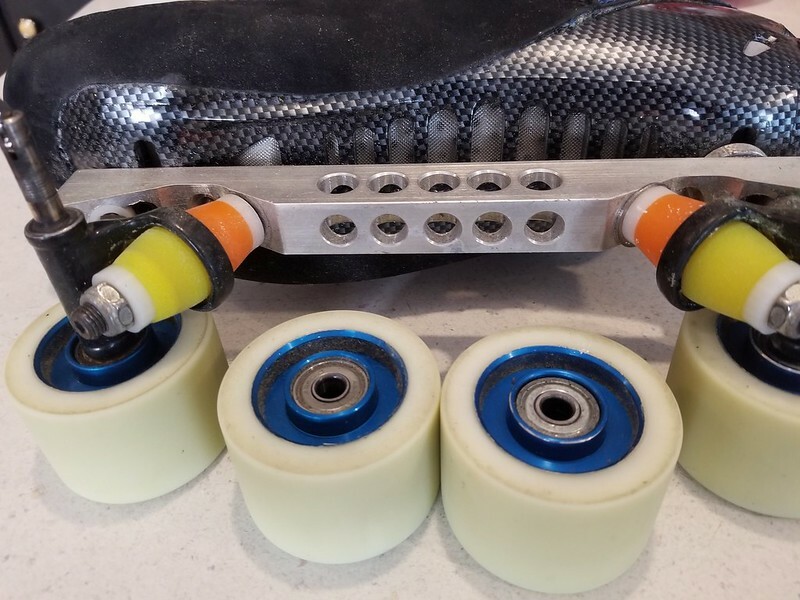 “Roller skates are slightly offset to give the skater proper balance as they manipulate their ankles to push against The skates as they accelerate.”. This very well may be true, but it still amounts to an edict. No one has found a way to measure the subjective experience of a skater. What the heck is “proper balance” anyway, it’s just balance. This question is no different than many others in skating. Three are almost endless combinations of boots, plates, wheels, cushions and personal skating styles and what you think worked, or what might actually be better or worse remains extremely subjective by nature. At least almost everyone agrees how to find the center mark, that, indeed, is measurable. Actually, the place to place a roller skate plate is settled science, and all roller skaters know where it is, it’s not confusing, it’s not difficult and this one picture is worth a thousand words. Roller derby skaters are on roller skates, and roller skates are all mounted with a slight offset. So, the plate isn’t centered on roller skates it’s offset, simple. And describing it as offset rather than centered is a big step.. Yes, skatelog has one or two members that center their roller skates plates purposefully, 99% of the roller skating public rides with their plates offset. Weirdly, that photo is being hosted by photobucket? PS My skates are quite a bit different than most, with the inline boots and having slots that run perpendicular to the center line of the plate I have and advantage in adjusting my boots from side to side and trying to find a happy center for my boots. It works very well. It's a little harder to just move a boot on a standard plate. It's a huge advantage for me and for testing. I don't use the style Ursle is pointing out. It's a good guideline, but if you know what you want and why, there are many different options out there. Compared to the post he is talking about where a "rule of thumb" is proposed by Dave, mine are toed in, and the heels pushed slightly out. Another benefit is it puts more of my foot/toes on the outside of the plate at the front, where the foot is weaker by the pinky toes. This helps me out a good deal with the long plate when doing toe work. Traditional line would wear my feet out when snaking the skates or having my toes rock back to the outside edge. My setup is anything but stock though. Cushions are trimmed, and hardware has been modified. Unfortunately, doing it on mine is really hard. Mounting 2 hard enough, 3 your boot is like swiss cheese, messy even if you fill them. I'm not sure how or even if my supination plays a part in my choice. Will see, but my feet naturally want to point to outside when I walk, making them turn inward is harder, not natural. So this actually might help me, I have read some supinators add even more to help correct. So I am going to try the "normal" 3mm out. I could add a shim, but I'm not ready for that yet. See what happens. Cause it free probably. At least the link still works, so many on SL are dead. Say, those are nice skates by the way.